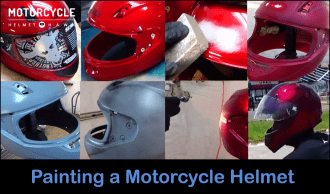 Awesome motorcycle helmets are necessary pieces of armor for road warriors. You’ve likely already scoured the stores seeking out the best one for your ride and gear, and most importantly, your protection. 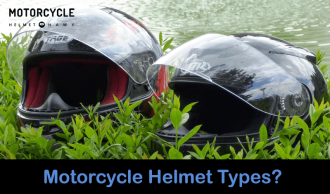 Whether what you seek is the most awesome headgear in terms of style, or the most awesome in terms of function, in any instance, an amazing helmet should excel in at least one aspect. It goes without saying that helmets don’t become awesome simply because of a high price, though. 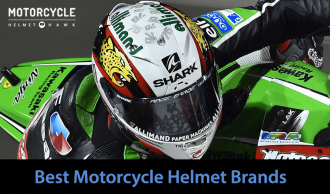 Below you will find some of the most popular and functional helmets currently available coming from different price ranges. There should be something here for everyone. 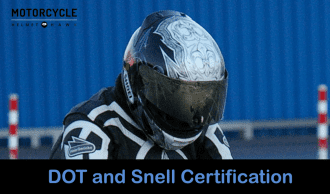 When you’re considering helmets, it’s important to keep a few things in mind. Of course, you want it to look great, but you also want to ensure it’s roomy enough to be comfortable, it’s not too heavy, and it has a head shape (usually “long oval,” “intermediate oval,” or “round oval”) that mimics your own for a tighter fit. IV2’s female helmet combines lightweight ABS construction with conveniences like removable cheek pads, a quick-release visor, a sweat-absorbing liner, and an EPS liner. 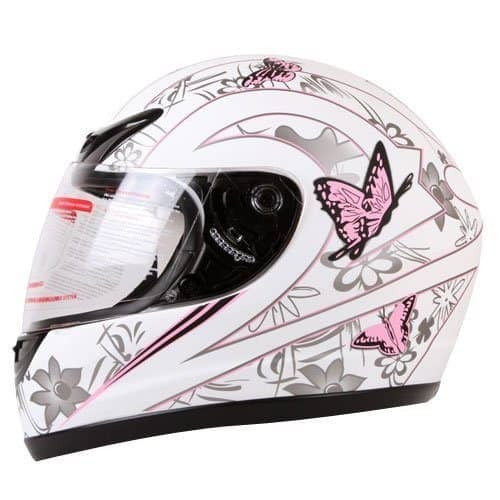 The white, grey, and pink design supplies femininity in style with sophisticated butterflies printed on the sides. 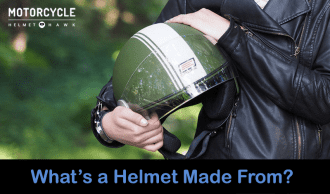 The helmet costs less than half a bill and comes in sizes S-L. This helmet is awesome for a lot of reasons, not least being the design. While undoubtedly girly, its matte finish prevents that design from becoming too loud, giving it a cool and feminine look. It fits well, doesn’t feel flimsy at all, and has Department of Transportation (DOT) approval. While there are tiny issues like the difficult chinstrap and slight stuffiness when you’re stationary, they surely yield before its price. At under $40, this is a steal. 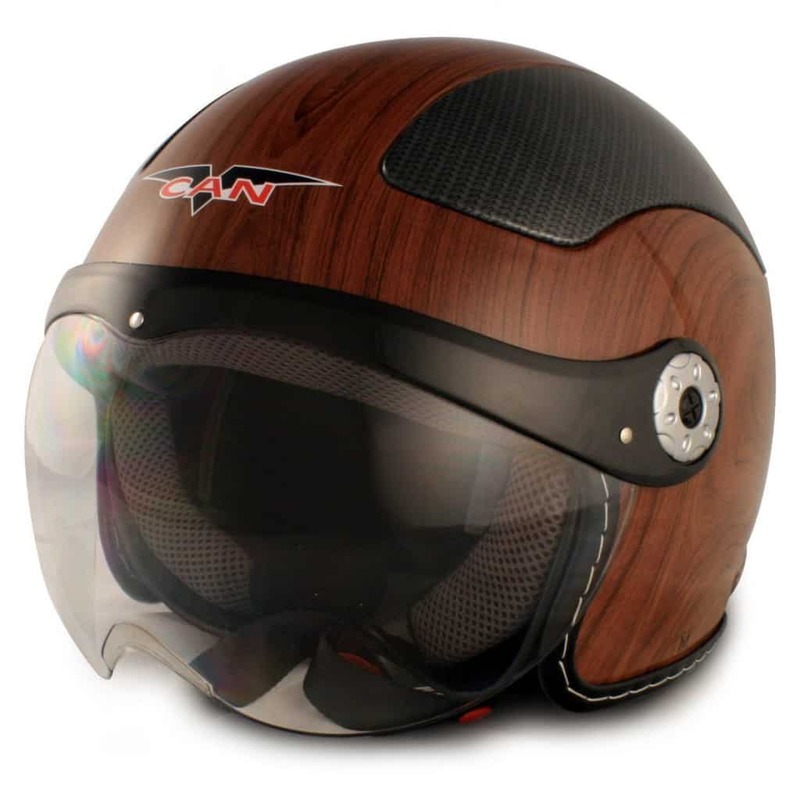 Designed in the traditional round scooter shell style so often seen in Europe, the VCAN V528 comes in other finishes besides the stylish faux wood one. The visor can be removed and repositioned and is made of scratch-resistant material. It has removable ear pads, a shock-absorbent lining, and DOT approval. This helmet comes in sizes XS-XL and black, matte black, royal blue, and white colors aside from the coolest finish, the wood grain. 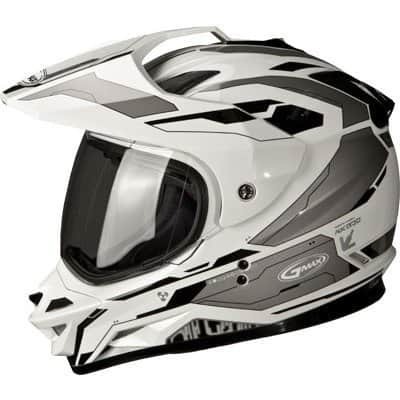 As another awesome-looking helmet at a low price, this VCAN model gives you the benefit of stunning style with DOT-approved safety. It could do with some tweaks; a removable inner lining would be a great addition, for example, and a few vents might help to alleviate the heat in summer. Still, for less than $100, this is a solid and cool piece of gear to add to your closet. GMAX’s GM11D is one of the top-rated models offered by the brand. 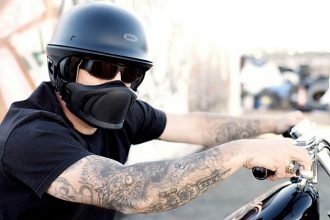 DOT-approved, it can be used with or without the visor, has a very large eye port that makes glasses or goggles easy to wear, and features glove-friendly vent controls, a soft and removable interior, and removable cheek pads that come in a number of sizes. The helmet itself is available in sizes S-2XL and costs about $100. 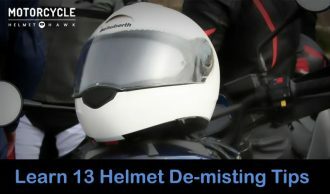 Coming in at less than $100, GMAX’s GM11D is a seriously awesome helmet because it does so much for so little. It checks all the boxes for style, utility, versatility, and safety, and also has replacement shields available—including a high-definition orange shield that can really up its value. The fogging might be a problem for people in areas with more grey days than sunny ones, but a breath box can fix that easily. 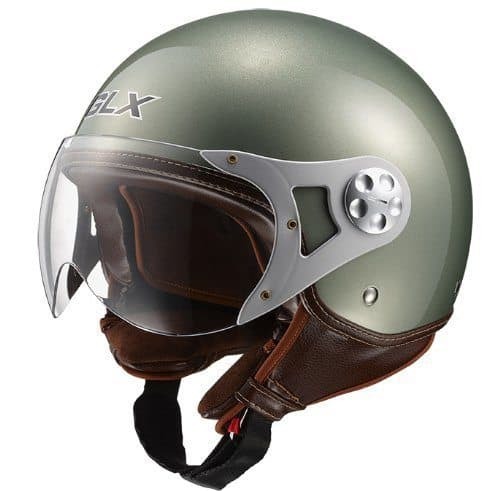 This GLX helmet is another of the scooter-style helmets. Boasting old-school Euro style, it is made of an enamel-painted thermoplastic shell equipped with a fully removable liner that you can wash for freshness. It comes in white, red, sage green, and blue. There is also a detachable leatherneck curtain for comfort. 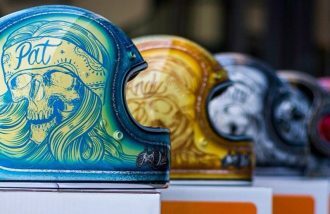 This is an awesome-looking helmet, no doubt about it, and that it comes in under a hundred deserves a special mention, too. You may want to try it first before buying, though, or at least order from a store with a great returns policy. Round scooter helmets do not look great on everyone, so you need to check out how it will sit on your head before making the commitment. Build-wise, though, it feels good. Some extra work in the visor set aside, this is a nice, sturdy-feeling helmet that should be capable of getting you through the average tumble with minimal injury. The Icon Airframe Ghost Helmet is made of a composite shell of Dyneema, carbon fiber, and fiberglass. It comes with a detachable breath deflector to reduce fogging issues and Icon’s Prolock for the visor. It is DOT-certified and has a removable inner liner, multiple vents you can manipulate at will, and a day-and-night-friendly amber shield. It also comes in sizes XS-3XL to fit most heads out there and costs about $500. Icon’s offering is a gorgeous piece of headgear, with the durability, material quality, and attention to detail you would expect of this well-known brand. Unfortunately, it’s also the most expensive product on this list, costing around 5 bills. 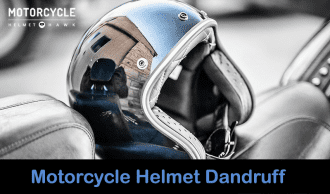 That’s not to say that it doesn’t have the goods to back up that price, but for those with tighter budgets, this awesome helmet might just be out of reach. The best buy among all these helmets is undoubtedly the Icon, despite it costing five times as much as most of the other products on the list. With its high-quality make, undeniable good looks, and neat trimmings (the amber visor and included breath deflector), it’s very hard to put down because you get everything you should for the price. 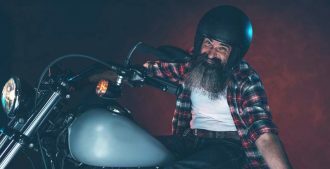 Of the remaining options, the IV2 Helmet is the next best buy—and not just for female riders either, as its cool looks have prompted some male riders to don it themselves. 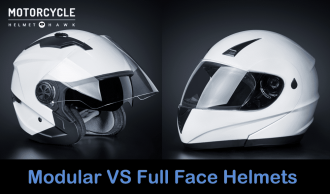 On the other end of the price spectrum from the Icon helmet, it nevertheless manages to deliver solid quality, so you know you are getting more than your money’s worth with it. The GMAX offering follows due to its lower functionality and safety. With that said, it would probably rank higher than the IV2 helmets if looks were more important than function.